Liverpool’s pre-season campaign will kick off in earnest next month – and supporters in the United States can go behind the scenes of our preparations at Melwood and watch a number of friendlies live via LFCTV GO. The Reds will ramp up provisions for 2018-19 with a quartet of domestic fixtures in early July as Jürgen Klopp takes his team to Chester FC, Tranmere Rovers, Bury and Blackburn Rovers. All four of these friendlies can be watched live via our online streaming service, LFCTV GO. Liverpool will then head to America to participate in the International Champions Cup with matches against Borussia Dortmund, Manchester City and Manchester United. We’ll be with the team every step of the way as they visit Charlotte, New Jersey and Michigan – and subscribers to LFCTV GO will get exclusive insider access that isn’t available anywhere else. The matches will be screened live on ESPN, but highlights will be later available on LFCTV GO. 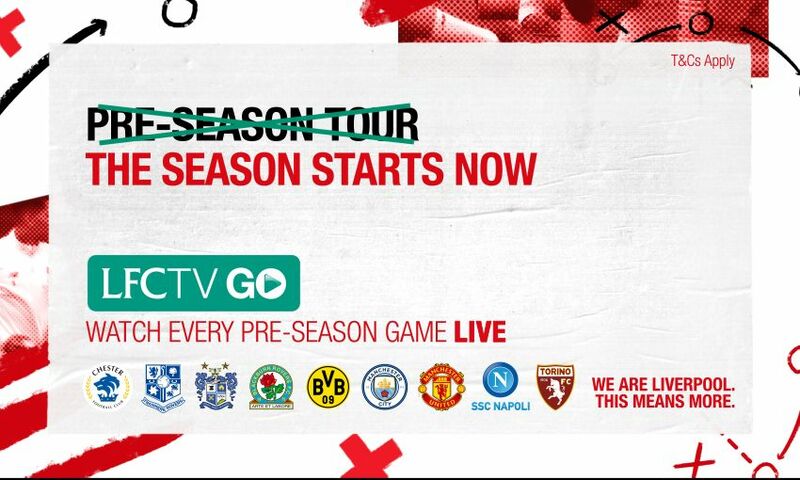 After that, Liverpool will begin August with a clash with Napoli in Dublin before rounding off their pre-season programme at Anfield against Torino – with both matches streamed live online via our official video service. So, make sure you don’t miss out by signing up to one of our services now by visiting www.liverpoolfc.com/watch.